Just days before his fateful trip to California. 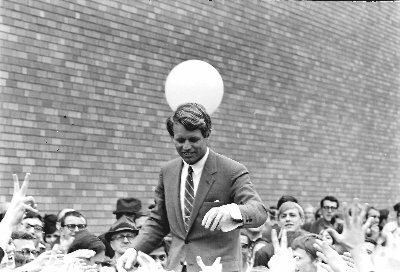 In May of 1968, Bobby Kennedy's campaign trail brought him to Oregon for the 1968 primary. 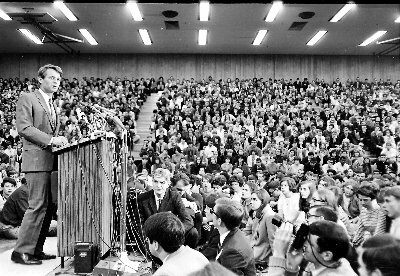 Lyndon Johnson had pulled out as a candidates, and Bobby was the leading candidate. 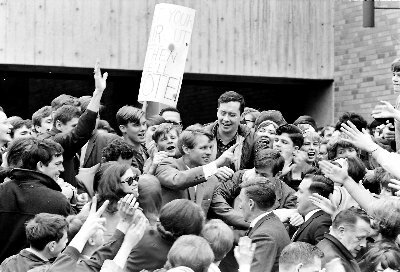 Bobby came in 2nd to Eugene McCarthy in Oregon's primary and then moved onto California for his fate with destiny. Bobby was even more dynamic than his brother John. 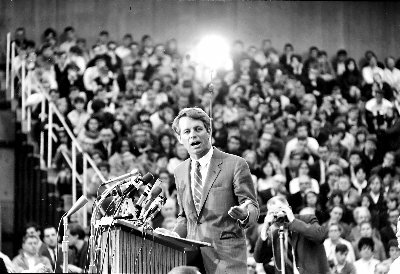 Bobby spoke to the common man about hope at at a time of despair over President Johnson's escalation in the Vietnam War. 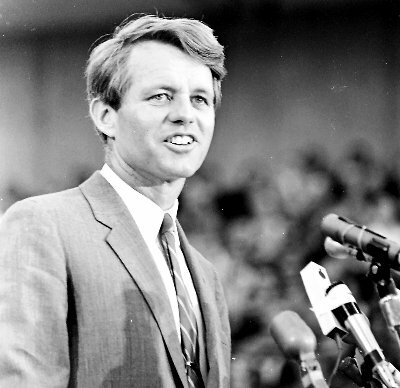 Bobby was charismatic and an eloquent speaker. 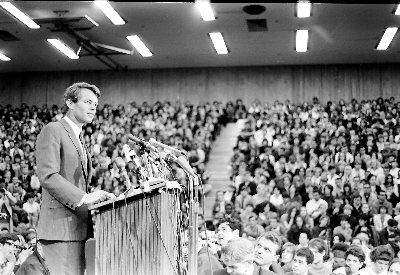 Students, faculty and national media crowded into the Portland State University gym to hear Bobby speak of his plans for our country. Bobby was accompanied by his sisters. Eunice Shriver is best known for her role with the Special Olympics. 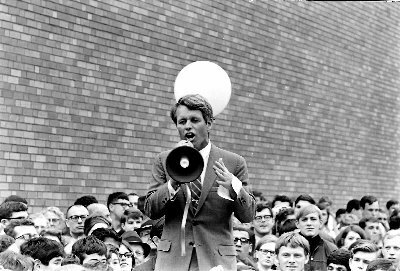 Even with Bobby Kennedy, there were protests. 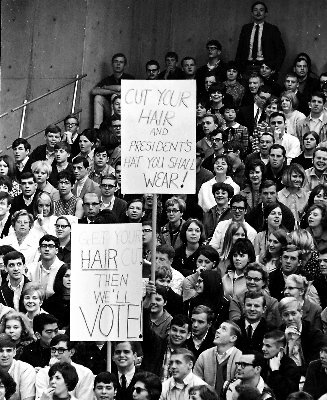 Until I scanned these old negatives, I had forgotten about the "Cut Your Hair" anti-Bobby crusaders. 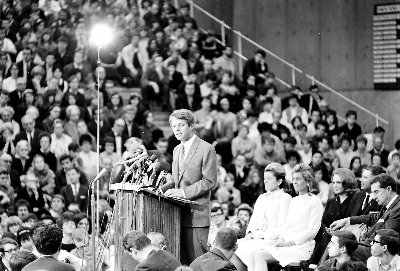 As Bobby exited the PSU gym there were more crowds outside, who could not make it into the crowded gym. In shaking hands as he made his way through the crowd, someone actually took his left hand cufflink as a souvenir. My how times have changed. 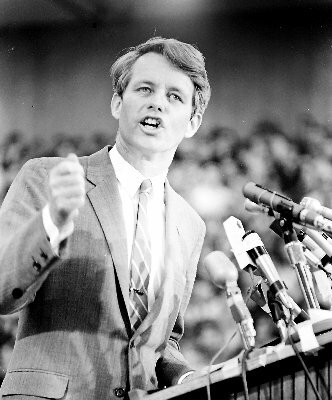 Can you even imagine ever getting this close to a presidential candidate today? Stay tuned to this website for more historical photos of Richard Nixon, Nelson Rockefeller, George Romney, and more.